Let's play a game. You suddenly find that you've got so much money that spending an amount equal to the purchase price of a reasonable dwelling on a car is no big deal. Lets assume, to make this a happier game, that you've already been generous to various good causes. Still playing? Good! This car is interesting at all kinds of levels including the sorts of features that will most likely be found in more ordinary cars as time goes on. Lets look at it first. There are two models, the 57 and the 62. The 62 is half a metre longer than the 57 and has a wheelbase of 3827mm. Both are big, heavy cars but the sculptured lines and airey interiors make them seem not so big unless they're parked next to something more work-a-day. The idea is that they're understated from the outside and that's pretty true even if all the detailing including the hand applied paintwork screams "some people took a LOT of care in making me". The panel fit all around is just so, and the swoopiness and careful curves lead to drag coefficient of 0.31. Let's get in. As you sit in one of the two back seats of the 57 the first thing you notice is that having pulled the door almost closed, it now silently closes itself properly. Big deal, you say, a Lexus does something like that. There is more however. In front of you, on the back of the front seat is an lcd screen. On this you can watch DVDs, satellite TV, WAP internet, and soon you'll get broadband wifi as well. Between the seats is a small drinks fridge and various beautifully crafted do-hickies to hold your champagne glasses or whatever. There is enough legroom to actually recline the backseats, and if you're feeling a little frazzled, you can press a button and get a nice gentle back massage. There are fold out desk/picnic tables as well. In the roof are three instruments in little pods. You can see the speed, time, and temperature there. The roof of the 62 can have an optional skylight over the rear section that is clear glass, or at the flick of a switch, is opaque. But wait, there's more! Little interior dim-able "opera lights" to set a bit of mood in the night; focussed reading lights; cordless hifi headphones for private noise making (and each seat has its own surround sound system). The list goes on. But it's not just the huge feature list that describes this car, it's the way things have been crafted and the materials used. There's also four point airconditioning with two airconditioners. There are a lot of electrics in this car which leads me to a question - what has the Maybach in common with your old surfmobile VW camper? One engine or four wheels is not the answer we're looking for here... two batteries! A slight help to this system is a solar panel in the roof. With it you can do things like having the engine off and the airconditioning on low while its parked in a hot sun. How does this thing go? It has a 5.5 litre bi-turbo V12 with 664 ft/lbs of torque at 2300 RPM and develops 543 HP at 5250 RPM. Zero to sixty is reported as 5.2 seconds and top speed is around 155 mph. All of this happens with pretty much zero fuss due to the care taken with noise- deadening. 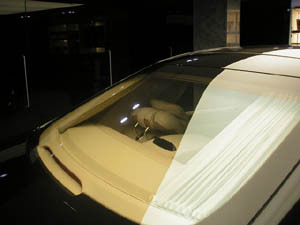 One example is the laminated sideglass that has four layers of membrane, one of which is an accoustic insulator. 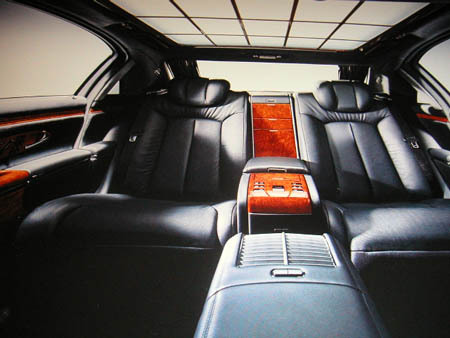 The driver's area, which is assumed to be for a chauffeur in the 62, has a nice wood and napa leather steering wheel. The instruments are lit by cold cathode tubes and white led's instead of bulbs and are nice and bright. 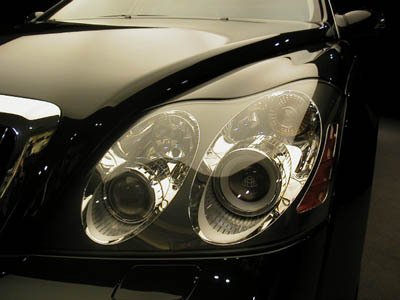 The intensity is altered by a sensor that checks the amount of ambient light. Information for the central display in the instrument cluster is accessed by illuminated keys on the wheel. The sort of thing you get is the trip recorder, audio system controls, car telephone, and the auto pilot system, as well as a system for setting the distance the car will follow traffic at. In the center console are more controls for airconditioning, a parking aid, and the electronic stability program, as well as a phone and intercom. Fuel consumption is, as you'd expect, not exactly wonderful: 11.5 mpg for City, 25.7 for extra-urban (not that bad) and 17.8 for combined. I imagine if you really floored it, you could make those figures a lot worse. 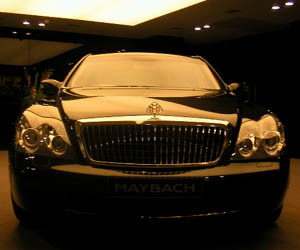 The Maybach is made by Daimler-Chrysler and there are outlets in selected Mercedes-Benz showrooms in major cities around the world. The price? A lot! ... about $350,000 in the USA and 290,000 in the UK. The word is that they're not going to make money on these at all, so I suppose that might make them some sort of bargain.